New Delhi – ZTE, the leading global mobile device maker, officially unveiled two of its premium devices, Axon Mini and Blade V6. Designed to meet the needs of today’s smartphone users, Axon Mini presents excellent artisanship and embodies the designers’ endless pursuit of perfection and sincerity. The ultra-thin Blade V6 is perfect for those that would like to enjoy their smart lifestyle enhanced by technology. The devices saw their globally launch at the Mobile World Congress in Barcelona this year. “At ZTE we are deeply committed to bring world-class technology and user-oriented design to the market in India. We believe that there is untapped potential in this market, which makes it a key driver for our Asia Pacific strategy. The launch of this range of phones in India signals the strengthening of our consumer offering in the market. We are sure with its superior design and best in class technology at competitive pricing, it will help ZTE to further cement our place in this burgeoning market”; said Mr. Cao Kai, CEO, ZTE Device India. Blade V6 focuses on what matters most to users today, eye catching design, vivid HD display and a high quality camera, all in the palm of one’s hand. It has a dual-SIM, aluminum body measuring only 6.8 mm in thickness and features. MediaTek MT6735 SOC accompanied with 2GB of RAM and 16 GB. There is a 13-megapixel camera on the back, as well as a 5-megapixel selfie unit. The phone is powered by 2200 mAh battery and runs Android 5.0. 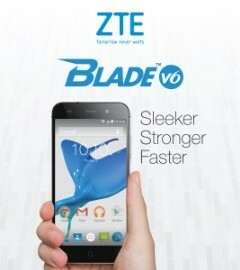 Blade V6 is priced at Rs. 9,999 and will be available at all Hotspots in Delhi from July 26, 2016 onwards. Axon mini retains the graceful curve of the Axon but it is more compact with a 5.2 inches to hit the sweet spot that harmonizes real estate with one-handed operability. Axon mini will appeal to an audience unique to itself and not eat into the Axon fans that like the bigger screen and the functionality that comes along with it. Axon mini has a body made from the same aircraft-grade aluminum alloy that you would find on a Boeing 787 lending it the premium look and feel. It is 7.9 mm thin and 70mm wide, the Axon mini’s 0.85mm thin bezels allow the device to feature a 5.2-inch AMOLED FHD 2.5D curved-edge screen. Axon mini supports three different biometric authentication options: fingerprint, voice control and eye-scan. Axon mini is priced at Rs. 23,599 and will be available at all Hotspots in Delhi from July 26, 2016 onwards.